Casino (10th Anniversary Edition) - BUY THIS DVD! Novelist Nicholas Pileggi again teams with Martin Scorsese for this epic drama about life in a casino. Robert De Niro plays Sam "Ace" Rothstein, the Jewish front man for one of the mob's premier Vegas casinos in the 1970s. 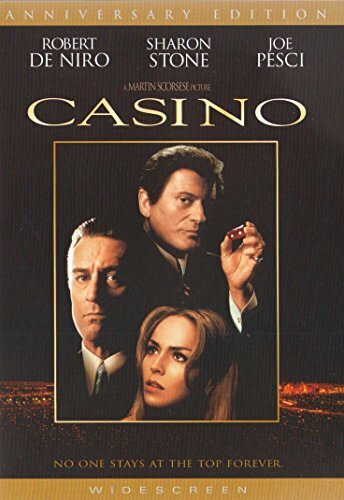 Joined by strongman Nicky Santoro (Joe Pesci), the casino runs smoothly until an icy blonde (Sharon Stone) jinxes their winning streak. Based on real-life underworld figures Frank "Lefty" Rosenthal and Tony "the Ant" Spilotro, CASINO is another electric crime portrait by the accomplished Scorsese. HOW TO WIN? SIMPLE. SEND IN YOUR NAME AND ADDRESS TO contests@efilmcritic.com. Put "YOU KNOW THE MONEY MY MAN SPENT ON THAT VEGAS MOVIE!" in the subject line and cross your fingers. We will draw names and one of the DVDs from Universal will be yours. Only 1 entry per household.